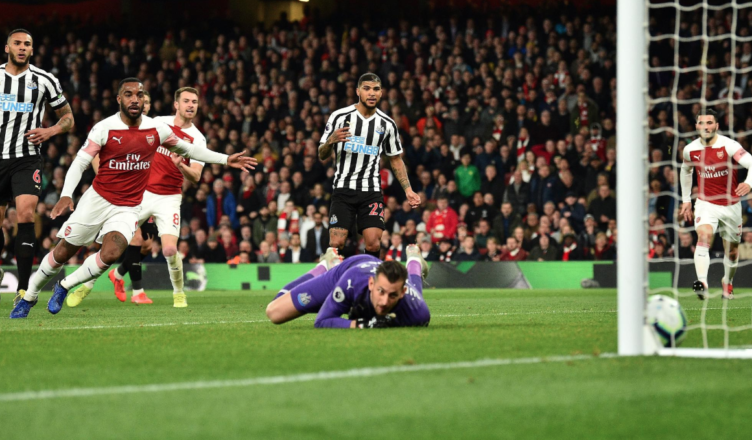 Arsenal 2-0 Newcastle: One to forget as toothless Toon are totally out-gunned – NUFC blog – Newcastle United blog – NUFC Fixtures, News and Forum. A tough watch for the thousands of Geordies faced with a long journey home tonight, with that being one of the most forgettable performances of the season from an attacking perspective. It felt like we could’ve played all night and not scored, with us failing to threaten the Arsenal goal, struggling to get anything going from start to finish. The first-half was a frustrating one. Arsenal played some good stuff, picking us apart at times despite us looking well set defensively, but our passing was wayward more often than not – meaning we often failed to take advantage of the inevitable openings away sides get at the Emirates. The ‘Three Amigos’ didn’t turn up and that continued for the majority of the second half. That said, I’m frustrated we didn’t see Jonjo Shelvey come on. He’s come on and changed the game to help us get results in our last two games, but he was nowhere to be seen. Even by Benitez’s cautious standards, that seemed a little odd. I was about to say that Lascelles was one of few to do a solid job, but he totally switched off for their second. Ritchie made a few vital clearances – including a brilliant goal saving header off the line – but he was generally sloppy, being one of many who regularly misplaced passes. Rondon was uncharacteristically poor, Almiron showed the odd glimpse but gave the ball away cheaply / flattered to deceive too often. It was a lacklustre performance and one that stunk of a side that felt it didn’t have a great deal to play for – not that this is any excuse; especially when we’re not yet safe. One to forget tonight, but we must pull our socks up after this one and be MUCH better against Palace on Saturday. Dubravka was probably man of the match for us which tells you everything you need to know. I didn’t really expect much from tonight, but that was awful!!. The front 3 had little impact on the game and there was zero creativity from midfield with Hayden and Diame in there. Ritchie tried hard, but was up against it throughout and it ended up a pretty easy win for Arsenal in the end – and that’s whats most disappointing for me. I expect them to beat us, but we didn’t really even make them work that hard for it – $hite. Arsenal have some very good players so I am not that disappointed. Aubamayang and Lacazette could get into almost any side in the league. Ramsey is off to Juve where he will receive 250,000 Euros a week after tax which would buy him 52 large sheep farms in Wales a year. Ozil gets 350,000 pounds a week which is roughly 364 BMWs a year. But… moving on. What are the odds of Palace getting a penalty on the weekend?I would say about 1/10 (10 to 1 ON) with Zaha probably 1/5. Got to go, I have to catch up on the 13 more articles about the Spurs stadium on the Daily Mail website. I really want Palace to beat them on Wednesday and then be knackered for our game. Cardiff play Man City on Wednesday and that should see them just about relegated. He really is a dumb b!tch. Diame gets 6 because “his contract might be playing on his mind”. WTF. I thought Rondon had his worst game for us and Wor Lee gives him a 7. Baffled by his marks almost week in week out. Ritchie 8?! Rondon 7 for his poorest game all season potentially? I’d say Dubravka was probably our best player – but even he didn’t deserve more than a 6. Dummett did OK, but the three amigos didn’t turn up and the midfield really lacked composure. The stats were Arsenal had won 9 in a row at home. So, now 10. Lacazette and Aubamayang had combined for 18 goals and assists in the last 18 games. So, now that is 19 in 19. We can’t really be that unhappy and when we pressed they looked even more dangerous. Luckily, we don’t play Arsenal away every week. Really looking forward to the opening of Spurs’ new stadium on Wednesday. Arsenal have some good players. If I had to name a premier league best 11 they probably wouldn’t be in it. That’s coz they have to get past Kane, Aguero, Sterling, Salah and the Silvas. 2nd 11 would have Aubamayang, Lacazette, Ozil and Ramsey though. So we were up against a really good team who got lucky with the 1st goal. The press are very disparaging of Ozil but he ran the show when Germany won the WC in Brazil. Give him some space and he will kill you. Didn’t expect a win but really disappointed with the way we played – League 2 hoof ball. Agree Rondon had a poor game. Not the only one. Rafa who we are lucky to have is an enigma to me when it comes to picking certain players. Joselu was picked more often than he should have been and how the hell Kenedy gets in the squad I have no idea. He’s not fit and I don’t think he really cares. Wouldn’t be good enough for the reserves. Ritchie may have poor games but you can’t fault him for effort. I was not surprised that Hayden was hooked. He was back to looking lost as to where he should be playing. Perhaps his revival was more due to Longstaff than his own abilities. I thought Lascelles was poor last night. Good defensively in the air but not so reliable against teams that keep the ball on the deck. Still not many teams will get a result against Arsenal at the Emirates. Very average display. Not where our points are coming from this season so we go rob satirday and we should be expecting to play better and have a better chance of winning at least and then that’s us safe. Interesting, I can get the comment box on IE but not if I’m on chrome ! Poor display last night, our mf was stifled and there was zero creativity, the front three had nothing to offer. Dubs our best player. Very poor last night. It’s what you expect when you have a spine of players with really poor ball skills. Lascelles, Diame and Rondon can’t control the ball well and cant pass well. Watch any group of kids playing these days and they’re way better than those three with the ball. Disgraceful, especially when you face a team of good technical players like Arsenal. We’re light years behind that. Let’s hope that effort and power is enough against Palace but it may not be. I’m not confident but believe we’re safe for another season anyway. I really don’t understand why Shelvey is getting no game time unless it’s already decided he’s leaving. For some reason the Daily Mail followed Lascelles on his trip to Florence. I hate myself for clicking on this story but I just had to see what they could possibly say about Jamaal’s day out. Then I looked at the photos. Does he really have tattoo of himself on his left forearm? Maybe it’s his Dad but it certainly looks like him. Olly: it is sort of ironic that Perez may be saying (it’s quotes from The Chronic so who knows?) but if we do show more ambition then Ayoze probably wouldn’t get in the team. The Spanish clubs he (possibly) named he wouldn’t even get on their bench. I mean, Perez is talking about Barcelona. He wouldn’t last a minute there before they were throwing pig’s heads at him. They don’t like Coutinho, so what would they think of Ayoze. And don’t get me started about Real Madrid. I went to see a game there and the booed Ronaldo. They booed Ronaldo FFS. I am also not quite getting this love-in for Rondon. Not because he was anonymous at Arsenal but because he is just OK in general. Brave and bustling but doesn’t scare the life out of you like Aubamayang, Aguero, Kane or Lacazette (I know they are out of our league). The ball bounces off him quite a bit. If we buy him he will be 30 at the start of next season. He’ll get us 10-13 goals a year but that only gets us to lower mid-table. I am not even saying we shouldn’t buy him. He should be an option, fighting for a place with another striker. I am pretty sure we will not even have to consider this because the Fatman ain’t spending 20 mil on a 30 year old. Mike Dean scuttles around pretty well for a 52 year old. He is still a tw@t and a showoff though. Mike Dean gives his 100th red card. Totally deserved. I have said this before but Ashley Young is the dirtiest player in the league and never gets called out because he plays for Man U. Well done Mike Dean! That may sound like I am contradicting myself but this time Dean was right. Am I allowed to applaud someone for making the correct decision even though I think he is a showoff and normally biased in favour of top 6? A win would see them safe (almost). I can’t wait for the opening of Spurs’ new stadium with only the 7 features in The Daily hateMail. But can Palace spoil their day and probably their season? I hope so. Then they will be on the beach on Saturday and the Mighty Mags can take advantage of Spurs’ misfortune. Bloody hell 97 sponsored links before you get to the comments. As much as he has done an excellent job for us this season I don’t see Rondón as our future and certainly not at the price mentioned by Eric. I would prefer a CF with pace. Groucho: I am going to state the obvious and say that you don’t get anywhere in the premier league unless you have a top striker. It was probably always that way but now you need a 20 goal a year man to compete. I think you have to be a bit lucky with who you buy as well. Arsenal have Lacazette and Aubamayang. With a better defense they would be challenging for the title. Then you have Man U who tried to buy goals and it hasn’t quite paid off. Lukaku has done OK but Sanchez has been a disaster. Same with Chelsea. Morata and Higuan. Nothing is guaranteed. Good luck trying to pry 40 million for one player out of the Fatman’s hands Rafa. We are going to need to get lucky. In this brave new world of transfer values I am not sure how we will compete. We might HAVE to buy Rondon or recall Gayle and then hope for the best with a younger player from Holland and Germany. I mean, a Liverpool reserve like Solanke or Ibe is going for 20 million. Half a season for Sancho and the papers are talking 80 million. Sorry Olly: I just don’t see any way that Rafa is dropping Dummett if he plays 3 at the back. Lejeune, Schar and Dummett with Lascelles on the bench. I wouldn’t trust Lascelles anywhere near Zaha and Townsend!!!!! With Hayden carrying a knock it gives us the perfect opportunity to play Shelvey or KI with Diame. There’s no need for 2 defensive mids for Palace at home. I think it is a coin flip at this point. Rafa will probably stick with the same front 3 although I wouldn’t mind seeing MUto. He’ll hold off though until we’re safe. I hate to be too critical after we played a very good team where none of our lot came out looking good. However, you have to wonder if Lascelles should be an automatic starter. I think he is a decent player, but he has a mistake in him. Not quite Titus Bramble, but almost. Someone who will shine for 98% of the game and then lose a bit of concentration, or simply make a bad decision, and give up a goal. Then it means that Lejuene has to start on the right of a back 3 where his lack of pace can be found out. Schar is much better there covering for Yedlin. Plus, Jamaal reminds me too much of Lamaal of Kajagoogoo and I get that Too Shy song stuck in my head for 20 minutes. I am trying not to overreact to an expected loss but I have thought this about Jamaal ever since the first time I saw him in a pre-season friendly in Milwaukee. Right, so there is a comment box on this thread through IE but no comments shown , just lots of ads. Through chrome you can see the comments but have no comment box !!!! lots of ads though. So post on IE and read via chrome. Kimtoon: I had a problem about 6 months ago with ads. This site was the worst and I considered never posting again. I ended up getting ADGUARD which solved the issues on my PC. For some reason Microsoft’s adblocker stopped working so I would get really annoying ads and not just on here. You might want to look into the spam/ad blocking software you have. Still get tons of ads on my mobile if I use it for this site but I hardly ever do. FFS, another article in the hateMail about Spurs’s stadium. It really is an eyesore. Not for the aesthetics of themselves but where it is. It looks so out of place being dumped in that part of North London. So, Chris “the intern” Waugh puts 2 and 2 together and thinks because Rafa did not bring Shelvey on against Arsenal that he has lost faith in him. Maybe he has but I don’t think this is enough evidence. We were being outplayed and have you seen how fast Lacazette and Aubamayang are. Maybe Shelvey’s own lack of pace would have been more of a hindrance than his passing skills would have been a help? In addition we had Ki who is a bit faster and better running with the ball and with the one touch passes. It didn’t work but bringing on Shelvey would have been more of a problem. I think we will see him against Palace but not from the start. Again, I think Rafa will try to nullify the pace of Townsend and Zaha with Ki and Diame. He will also probably try to shore up the Jamaal Lascelles size hole in the defense by bring back Schar who can provide some of the creativity and passing range of Shelvey without the defensive limitations. I reckon Rafa will stick with the 3 central defenders to provide cover on the wings. I have watched Palace a few times and if they rely totally on Townsend and Zaha. Take them out of the game and they have nothing. I would like to see Muto start a few games mainly because he is our player and Rondon isn’t. And there is no way Fatty is spending 16.5 million or whatever it is on a 30 year old. I am sort of confused though because Rafa seems to see Muto as a centre forward. Competition or a replacement for Rondon. He’s looked much more like competition for Perez or Gayle to me so I am not getting Rafa’s thinking on this one. A draw would probably suit both teams. Palace are an up and down team, probably more so than us so this is hard to predict. Going for 1-1. Not a conspiracy but NUFC have won 5 on the trot at home and these runs tend to be broken in games where we feel we probably have the odds in our favour. I have been a NUFC supporter for long enough to not get my hopes up too high when everybody expects something. I tend to go the opposite when the pundits all tip us and Uncle Ed’s polls show a very high % expecting a win. Going for a draw myself. What on earth is going on or not with the comments box Olly. It needs sorting! and as if by magic there it is – the comments box.